Since we finally got the pineapple sliced up, it seemed only fair to slice up the nice fresh canteloupe too! Ben wasn't needing a huge bento lunch, as he had already had breakfast & lunch before preschool, but he still likes a substantial snack in the afternoons. Wednesday nights are also church nights, so dinner is around 6pm, and I need to pace the rest of the day's food or I have a little boy who wants to eat at 8:30 when he gets home. 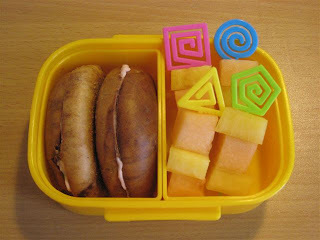 Mr. Ben took a cinammon raisin mini bagel with strawberry cream cheese (sliced in half, it fit perfectly in his box) and fruit kebabs of pineapple & canteloupe. After I took the picture, I laid the kebabs flatter in the box and added some loose chunks of fruit to hold them in place. Ben never complains about extra fruits. Looks yummy! Can you email and tell me where I should search to find bento supplies? My kids love to eat things made special. They love MTM but I want to find more things to use. I stumbled upon your blog last week and revisited today because I am going to start packing lunches this way going forward. There are usually a handful of tupperware, plus a couple baggies. Too messy! This is so clever. Bonnie, my mom & dad are coming for Easter. Let me see if I can get her to grab a Strawberry Shortcake box for Meghan (their Dollar store sells them, but it's a Canadian chain) and I think I have a spare Diego one for Kaden. I'll email you in a bit.